As motorhome tourists travel through Europe there is an abundance of what are referred to in the English language as 'Aires'. In the same way as 'a la carte' which means 'on the menu' and 'nom de plume' which means 'pen name' have been adopted into the English Language so has 'Aire de Stationnement' which means 'parking area' the full title however has been shortened to 'Aire' for convenience. 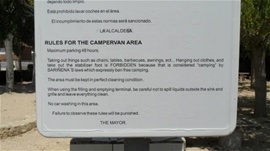 Throughout Europe if local Bye-laws are checked it will be seen that camping, wild or otherwise, is often forbidden in an area. Tourists using motorhomes are expressly not permitted to engage in any activity which has been deemed to be camping, other than in approved camp sites or caravan and camping parks as they are commonly referred to. It is the effective use of this type of Bye-law which ensures 'Aires' remain simple parking areas and enables local law enforcement to ensure such areas do not degenerate into unofficial encampments with undesirable consequences for the local environment. Local authorities have appeared not to have understood what their counterparts in Europe have known for quite a while, that camping as an activity can be defined and if environmentally or socially inappropriate in an area, like any other such activity, it can be controlled through its prohibition by an appropriate Bye-law. In the absense of such foresight Local Authorities in Ireland seek to ban outright the placement of all'temporary dwellings' in certain areas. Motorhomes, falling within the definition of a 'temproary dwelling' are thus restricted in where they may park. The effect of this blunderbuss approach is that Ireland is percieved as being unfriendly to motorhome tourists. 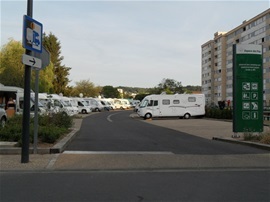 The creation of a sufficient number of such overnight Motorhome Parking places will enable motorhome tourists to tour at their leisure and enjoy the beauty of our country, be it our rugged Atlantic coastline, excellent 'Blue Flag' beaches, inland lakes and mountains or historic cities and towns . Motorcaravanning Ireland does not support camping. wild or otherwise, apart from on private land with the owners permission or approved caravan and camping parks. Parking! Camping! so What's the Difference? 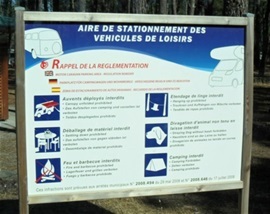 Throughout Europe local authorities/councils have in place anti-camping Bye-laws while at the same time providing parking facilities for motorhomes. It occupies no greater a footprint than when it is being driven.